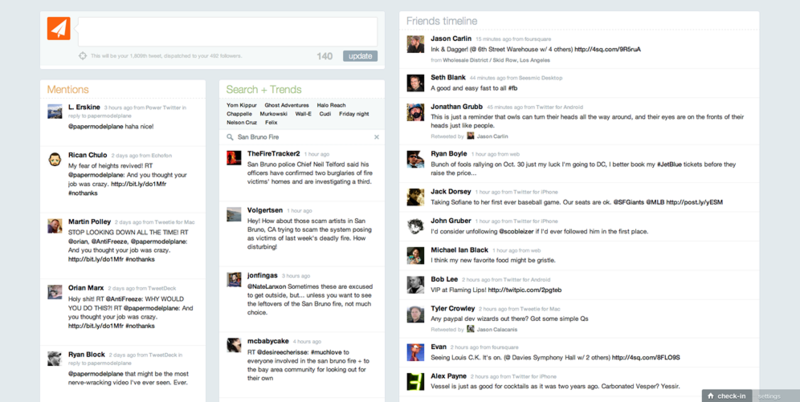 Beating #newtwitter and #newnewtwitter to the punch since January 2010. Ever send out a tweet, then catch a typo a minute later? If you're anything like us, it's a race against the clock to delete that bad post and write a corrected version before anyone discovers your mistake. With Arrow, just click on your tweet, edit it, and hit republish. That's it — fixed in just a couple seconds. Sometimes you need to mull it over before you post. 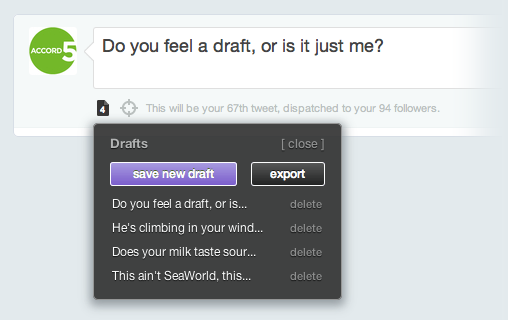 That's where drafts come in — write a tweet and save it for later, just like email drafts. It's never been easier to upload an image to TwitPic along with your new tweet: just drag an image file right into the text box and we'll take care of the rest. The URL to your new photo will be appended to your tweet in seconds. 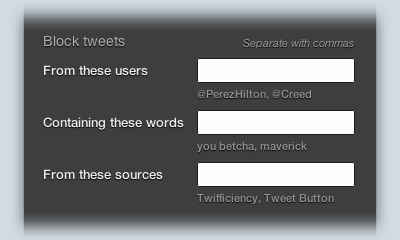 Arrow can now automatically filter tweets based on their author, application/source, or words that appear inside the message. The filters that you create are applied across your entire friends timeline, mentions, and search results. 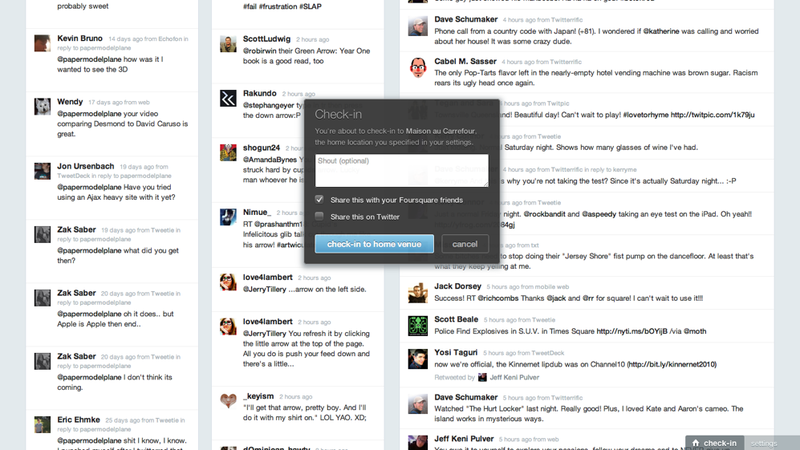 Don't want people's Foursquare check-in tweets cluttering up your stream? 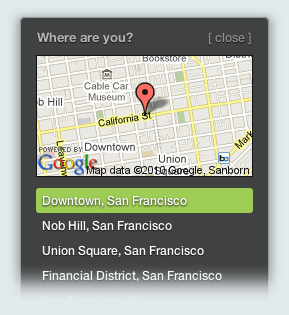 Just create a filter for the "Foursquare" source and you won't see them anymore. Or maybe you're an Android fan who's tired of people jabbering on about the new iPhone — add a filter for the word "iPhone" and you'll never see any tweets about it again. Have you ever wondered why a particular topic was trending? Now you can hover over any trend to see an explanation. 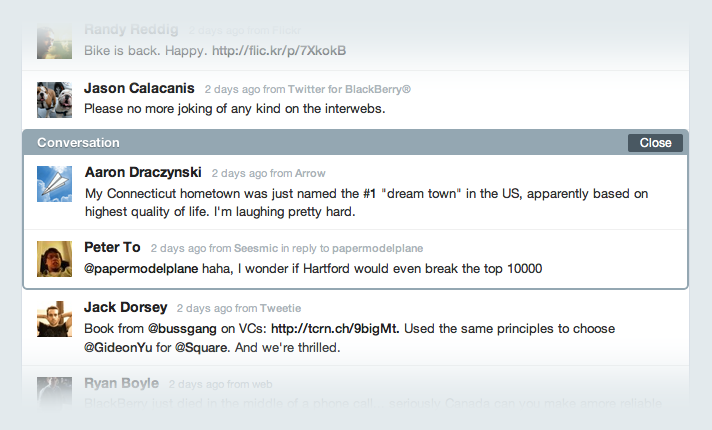 Arrow brings together your Twitter friends timeline, mentions, search, and trending topics into one incredibly simple, elegant interface. And we have all of the basic functions you'll need: compose a new tweet, reply, retweet, favorite, unfavorite, delete, and so on. 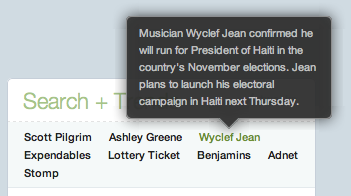 Unlike many other web-based Twitter clients, with Arrow, there's no need to click a refresh button. 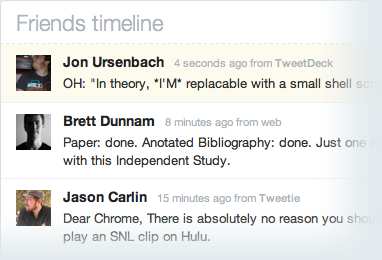 Arrow automatically pulls in the latest tweets for you. New tweets slide onto screen, no interaction required. Even the timestamps for every tweet are live to the minute. Load up Arrow, then work in other tabs or windows. 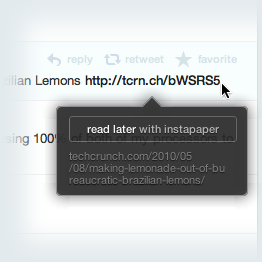 When new tweets or mentions arrive, an indicator will appear in the title of your Arrow browser tab. You can also turn on a notification sound for all new tweets, or just for new mentions. Trends: now with less nonsense. 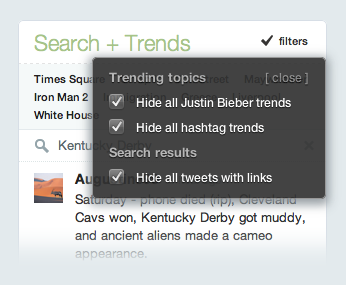 We even built a Justin Bieber filter for trending topics. We don't show any trends containing the word "Bieber", or any misspellings or variations thereof. If you actually like Justin Bieber because you're an 11 year old girl, you can turn that filter off. View photos and videos easily. 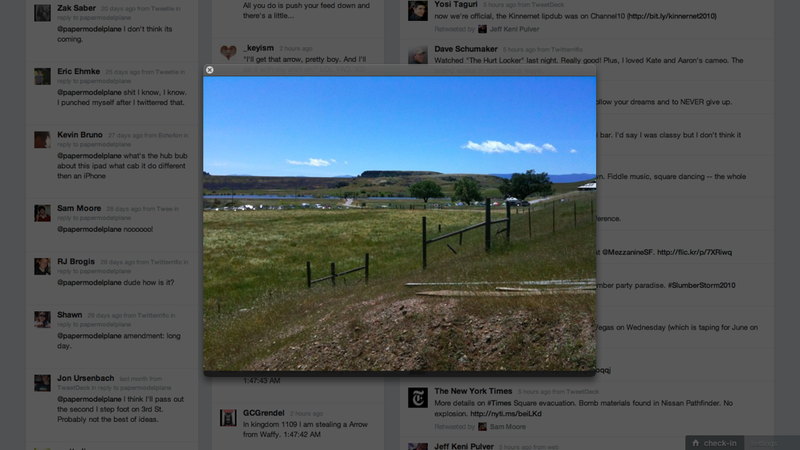 In any tweet, click on a TwitPic, yFrog, or YouTube link and the photo or video will popup right there. 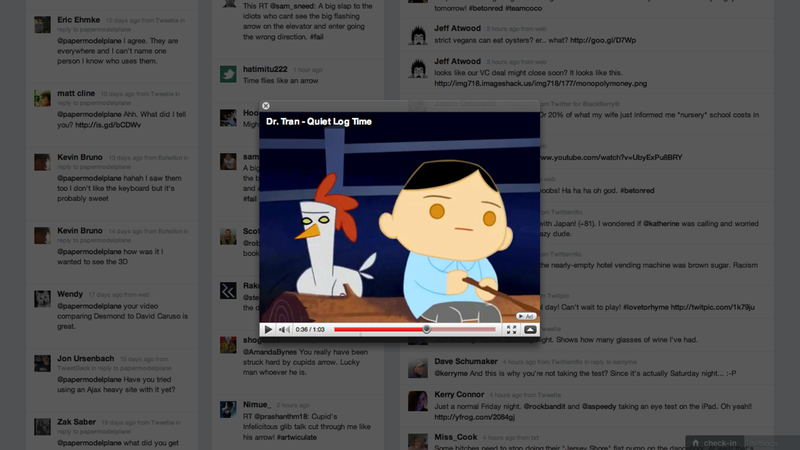 You won't even have to leave Arrow to watch the viral video of the day. When a reply appears in your timeline, it's not very useful if you can't see the message that your friend was replying to. Arrow makes this really easy; just click on the "in reply to..." link, and we'll backtrace the entire conversation for you. 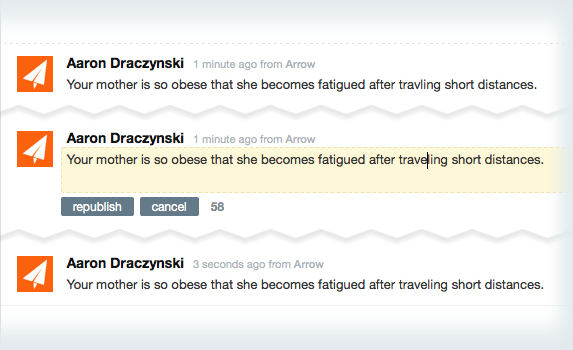 With Arrow, you can optionally attach your current location to your tweet before you send it. Maybe you want to let your friends know where you are so they can meet up with you, or perhaps you have something interesting to say about where you are right now. Whatever the case, Arrow makes geotagging your tweet easy: just hit the crosshair icon and Arrow will find your location. Foursquare addicts: if you're like us, you're good at remembering to check-in to various places while you're out and about, but you forget to check-in once you get home. Arrow has a "home" button in the bottom right corner of the screen, so when you're back at the house and catching up on tweets, you can just hit that button to check-in to your home venue. Not sure where that short link is going to send you? Just hover over a short URL and we'll show you exactly where it points to. Don't get rick-rolled again. The dilemma: your friends post lots of links to interesting articles and blog posts, but you don't always have time to read them. With Arrow, you can quickly save links to Instapaper, a free service that keeps track of all the stuff you want to read later. Just fire up the handy Instapaper app for iPhone or iPad and read your saved articles on the go. an ACCORD5 project, © MMX. design by papermodelplane.